SOUTHAMPTON: Maurizio Sarri has got little wrong in the three months since he was appointed Chelsea head coach and the Italian was in credit again after starting Ross Barkley in a 3-0 Premier League victory at Southampton on Sunday. Barkley has operated largely as understudy to Mateo Kovacic in recent weeks but, having been selected ahead of the on-loan Real Madrid man, the England international responded by setting up Eden Hazard's 30th-minute opening goal before adding the second -- his first for the club -- just before the hour. Alvaro Morata came off the bench to complete the win at St Mary's in added time. Hazard's goal was his eighth of the season, seven of which have come in Chelsea's opening eight Premier League games, and continued his outstanding form since Sarri succeeded Antonio Conte as Blues boss in July. But Barkley's performance was also a major factor in Chelsea's victory that ensured they maintained the pressure at the top of the Premier League immediately before fellow title-contenders Liverpool and Manchester City met at Anfield later Sunday. This was only Barkley's fifth league start since his £15-million ($20 million, 17 million euros) transfer from Everton in January, a move that had been put on hold from the previous August while the player continued his recovery from a serious hamstring injury. Kovacic has performed excellently since arriving at Stamford Bridge but Barkley's display suggests the options available to Sarri are increasing as Chelsea look to build on their unbeaten start to the league campaign. 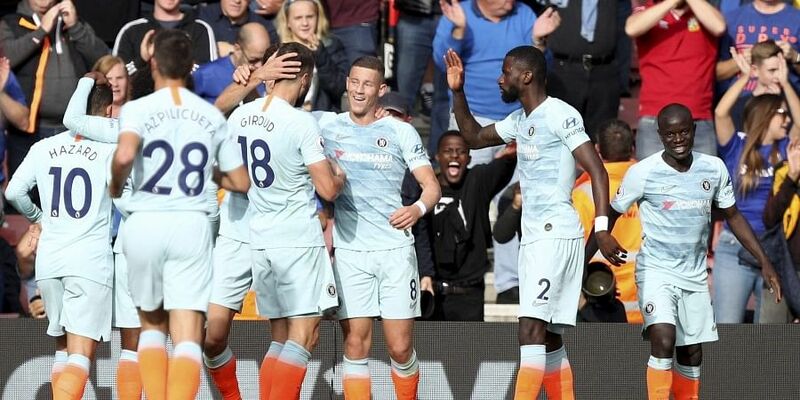 Chelsea were always expected to beat a Southampton side who have so far failed to reverse last season's woeful home form, but Arsenal's comprehensive 5-1 defeat of Fulham earlier in the day only added to the pressure on Sarri's side to collect three points. The confidence and belief that has grown within Sarri's side during the opening weeks of the season was evident in the way Chelsea overwhelmed Southampton during the opening stages of the game, denying the hosts the opportunity to establish any kind of foothold. Resolute, desperate defending by the Southampton back five together with Chelsea's tendency to over-elaborate denied the visitors the early lead. And had Danny Ings not somehow managed to lift the ball over the bar after meeting Ryan Bertrand's left-wing cross when just four yards out of an open goal, Chelsea would have been playing catch-up. As it was, the missed opportunity drew a swift response from Sarri's side. Barkley moved quickly to close down Pierre-Emile Hojbjerg inside the Saints half before delivering a well-weighted ball into the path of Hazard who finished with ease. Willian floated a ball towards the far post where Olivier Giroud acrobatically volleyed back across the face of goal, allowing Barkley to add Chelsea's second from close range.